In the realm of spiritual successors, there are few that capture the essence of their muse like Bloodstained: Curse of the Moon does. Let’s not dance around the subject; this is as Castlevania as a game gets without carrying the official license. The question becomes then does this title carry the nostalgic wonder that served as the foundation of a franchise that became a household name or is it akin to the black sheep we lampoon known as Simon’s Quest? 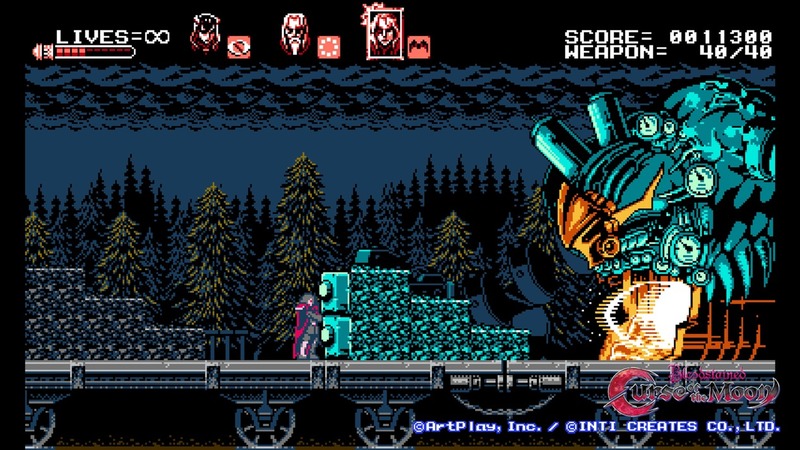 The graphics are exactly what should come to mind if someone tells you that there is a NES style Castlevania game being made on modern platforms. Yes, the individual assets still only possess a few animation frames for their actions but there are so many of them taking place at the same time. For example, you can be throwing a special attack at an enemy, while above you chandeliers sway and in the background tons of trees go by all at the same time without experiencing the slowdown that often came with vintage hardware. Similarly, this is not the most robust color palette but it’s so efficiently put to use that you will always be able to make out your avatar from its environment. As for the denizens of these cryptic environments, there is a good variety here. You will come across most enemies a second time that is just colored differently to indicate a higher resistance or different attack type but usually just a second time. They have provided enough variety from simple spiders and bat to more outlandish creatures like demons and dragon heads that the developer didn’t have to lean on this staple to the point of overuse. The boss fights in particular are awesome to see in action. 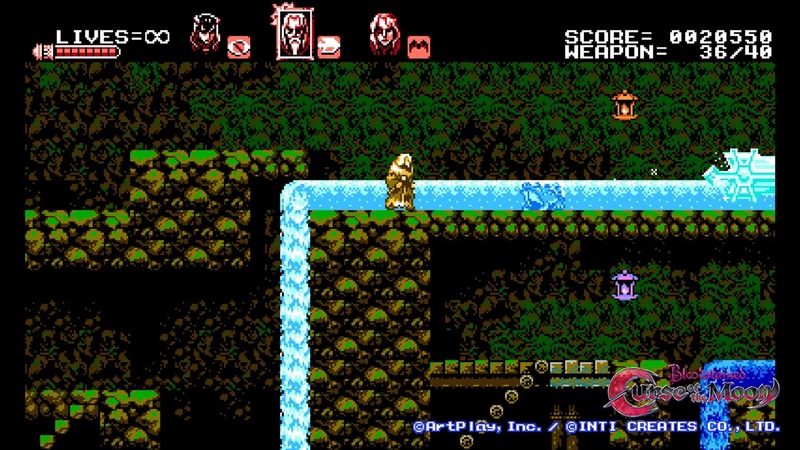 These are now enemies that take up a lot more of the screen real-estate than possible on a true 8-bit console. Whether that is because of their sheer size or because of the multitude of attacks they are throwing out, you will constantly be looking for that one safe place to catch a breath or throw a couple counter punches. 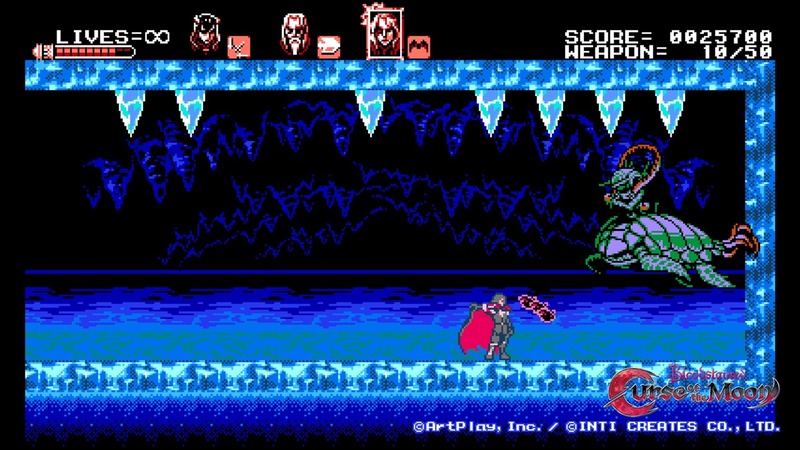 It is possible that some might be tempted to argue that these would be more fitting in a franchise that features the blue bomber but I feel that the early boss fights in Castlevania games were often just a basic battle of attrition and that the strategy and pattern recognition being present even from the first level is a welcome change. Luckily many of these fights can be made easier if you use the appropriate character, as you can ultimately have up to 4 that you can swap in and out at any time with a simple button press. You begin the game as the sword wielding Zangetsu who seems to be the most limited in movement and attack range. Over the first few levels you can choose to unlock Miriam who possesses a slide dash, Alfred whose variety of spells make up for his frail stature and Gebel the resident vampire who joins the protagonist on his venture. So if you are in a fight with an enemy hovering over you that just doesn’t want to lower itself to be victim of the forward thrust that Zangetsu is capable of with his sword, swap to Gebel and his basic attack will see three bats come out of his cloak and attack in an upward motion. Combat is not the only instance that these different abilities will be beneficial. There is an item hidden in each level that increases an attribute such as your health pool or the strength of your attack however it will always be on a branching path that will not be accessible without your allies. Maybe you need to turn into a bat with Gebel to fly up to a unreachable staircase or to slide dash under a barrier with Miriam but if you choose to go it alone with just Zangetsu you will be cutting yourself off from many beneficial items that will make the game easier for you. This is where the length of the game discussion comes into play. Much like a lot of old NES games the difficulty is what forces you to spend a lot of time with it. So naturally playing on the casual setting, which allows for infinite lives and removes the very magnetic to instead death pits feature of knock back, will only take a couple hours. Also playing like this will only really mean defeat from missing a jump or the first time you face a boss while you figure out its pattern. If you don’t want to just breeze through it, pop the game on veteran and run it with just Zangetsu, chances are you will multiply you playtime easily. If that’s not enough there are unlock modes like Nightmare and boss rush that will add some replayability. The last thing that needs to be touched on is the controls. For the most part they are just fine. Characters are responsive and because of the smooth framerate that doesn’t suffer from slow down your character will most likely always be doing what you want them to do. That is, once you get used to the jumping again. Remember in old games where if you jumped straight up and weren’t already pressing a direction, that was it, you went up and down. That’s what happens here so plan out your movements, luckily if you have played enough retro games you will get used to pressing a direction just before jumping after only the third or fourth pit you fall into. Make no mistake about it; this is the best game that could have been spawned from the 8-bit NES Castlevania games and a shining example of how to do a kickstarter stretch goal right. 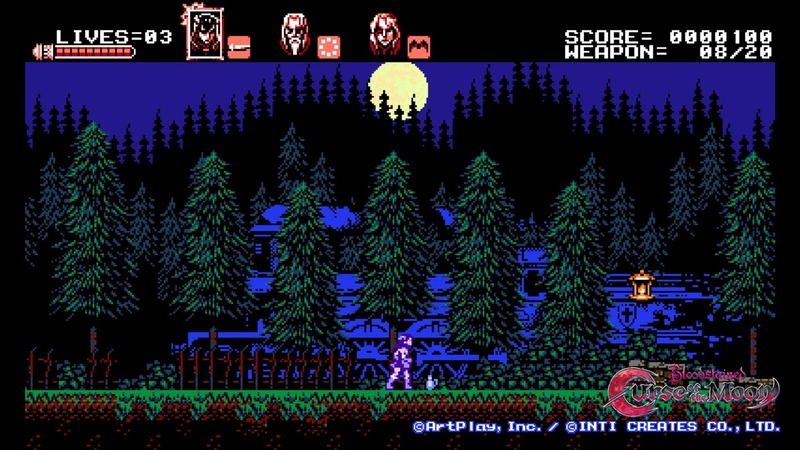 If you are a fan of the Dracula hunting series or retro games in general, you probably haven’t made it this far into the review without already looking it up on your platforms digital shop. For everyone else, now is the time to do just that.